The Moonstone is an epistolary novel, written by Wilkie Collins and first published in 1868. It is set about 20 years earlier. I found the pace of the novel to be a little slow but built to a great end. 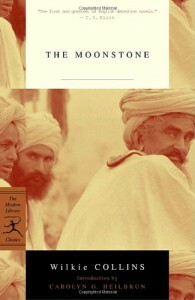 The central conceit of the novel is that what we are reading is a collection of written statements from a variety of people who were witness in some manner to the theft of an Indian diamond called the "Moonstone". The voice is excellent throughout and changes a bit in each section with the personality of the different "writers". It is written in the usual verbose manner of Victorian literature (I by no means intend "verbose" to be a criticism here). There is a marked...I don't want to say misogyny as women are valued, but the Victorian sense of manhood and womanhood is very much in evidence here. There is also a typical sense of class distinction and upper class superiority throughout with a bit of racism toward Indians, though nothing unusual for the time. I would imagine anyone reading this review would be prepared for this but one never knows. If you can't tolerate such things in your reading than by all means skip this one. The different "writers" are distinct from one another and well done. My favorites were Gabriel Betteredge, the main servant of one of the involved families, who opens the narration after some background information, and Drusilla Clack, another member of the family who is an obnoxious evangelical Christian. Betteredge is dry and witty and has a very likeable voice. Drusilla Clack is truly, wonderfully obnoxious. She is haughty and hypocritical. She is utterly unable to deal with people is anything like a reasonable manner without injecting her evangelism, unwanted at every turn, into the subject at hand. I think most of us have at least met someone like this and it is interesting to note that these people have been at it for more than 100 years. Other characters include Franklin Blake, one of the protagonists I suppose of this novel, Mr. Bruff, a solicitor and family friend and the well known detective Sergeant Cuff. Sgt. Cuff is one of the brilliant detective characters like Dupin or Holmes and is, in my estimation, their equal. I thought this was a truly excellent novel and, while the English country house style is not my preferred style of crime fiction, The Moonstone is a wonderful example of this type of book.